It’s been a rough few days, folks. A really rough few days. No running water in the apartment — and that’s the least of it. Despite the plumbing obstacles, I managed to whip up a batch of cookies for a cookbook signing -slash- potluck by my culinary crush Heidi Swanson. Her new book, Super Natural Every Day, has already made the NYT Bestseller list after like a week on the market. I didn’t even have time to let the hot cookies cool down before popping two dozen of them into two empty egg cartons (an impromptu innovation in pastry transport) and hopping on my bike to dash across the border to Berkeley. Those that didn’t make the carton cut found their way over to my friend Noa’s place, with its lovely succulents. When things fall apart, I’m grateful for generous, loving, and and precious friends, and for cooking. At times when I’m feeling down, or, even more precisely, when I’m focusing very intently on uncomfortable and difficult emotions and experiences, my appetite plummets and gets very particular. I crave fruit and whole-milk yogurt, water, leafy greens, things like that. (Again, this is when I’m bringing mindfulness and patience to the difficulties. When I’m flat-out stressed, and especially rushed, it’s a whole ‘nother matter, and that’s when I turn to the sugar, the French fries, the “numbing” foods, as Noa calls them — not pejoratively, but descriptively.) I feel lucky and privileged that I’m able to feed my healthier, deeper cravings as they arise. 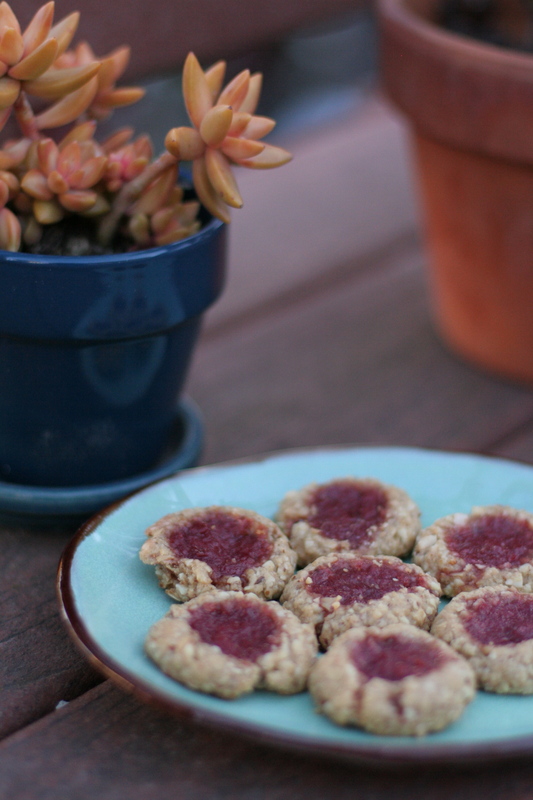 So in this case, with little appetite for anything that wasn’t recently growing on a tree, I wasn’t as keen to devour these delightfully tart versions of my favorite jam thumbprint cookies. But the act of creating food for others is grounding and healing, too.